A useful page for making sure we're all on the same page! By accessing this web site, you are agreeing to be bound by these web site Terms and Conditions of Use, all applicable laws and regulations, and agree that you are responsible for compliance with any applicable local laws. If you do not agree with any of these terms, you are prohibited from using or accessing this site. The materials contained in this website are protected by applicable copyright and trademark law. Data you provide directly. Contact information, addresses, phone numbers, e-mails and payment information are collected solely to achieve three purposes: delivery, billing, and correspondence. These are required for successful transactions and we limit our use of your data to these purposes. We do not sell your data to any third party for any reason. Analytics. We may directly collect analytics data, or use third-party analytics tools and services, to help us measure traffic and usage trends for ORCHARD At The OFFICE. These tools collect information sent by your browser or mobile device, including the pages you visit and other information that assists us in improving our service. We collect and use this analytics information in aggregate form such that it cannot reasonably be manipulated to identify any particular individual user. In other words, we use analytics to see what people do on our site, but not what YOU, personally, do. Cookies. When you visit our site, we may send you one more small text files containing a string of alphanumeric characters known as cookies. (We will send your physical address fruit, but your computer may get a cookie). This uniquely identifies your browser to enhance login and navigation. It may also let us know which pages were visited and how much time was spent on each page. A persistent cookie remains on your hard drive after you close your browser. Persistent cookies may be used by your browser on subsequent visits to the site. Persistent cookies can be removed by following your web browser’s directions. A session cookie is temporary and disappears after you close your browser. You can reset your web browser to refuse all cookies or to indicate when a cookie is being sent, however, understand that some aspects of our site may not function properly if the ability to accept cookies is disabled. Conducting Business. Information provided directly is used to make sure that the proper flow of goods and services can take place with appropriate remuneration. Correspondence. In addition to contacting customers to confirm or clarify and issues related to orders, we periodically send out e-mail reminders of upcoming holidays, changes in the fruit market, et cetera. These messages are not sent out with the sole purpose of marketing, though they may also contain promotional information. Their primary intent is to guarantee effective customer service through direct communication. Analytics. 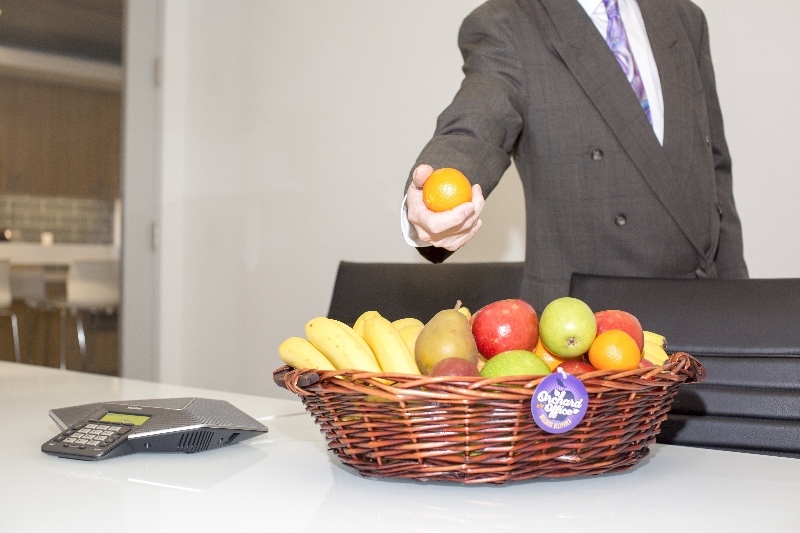 This information is used to insure that ORCHARD At The OFFICE is carrying its message of wellness through office fruit delivery to Texas businesses. Billing Information. Any financial data provided to ORCHARD At The OFFICE is secured to a reasonable extent. Users are responsible for creating and maintaining secure login and password data for their accounts. Login Changes. Any requests for a change in the login should be made via contact form or by e-mail to getfruit@orchardattheoffice.com and will be completed by telephone for identity verification. Support staff does not have access to credit card information. Cookie Opt-Out. Please refer to your mobile device or browser’s technical information for instructions on how to delete and disable cookies, and other tracking/recording tools. Depending on your type of device, it may not be possible to delete or disable tracking mechanisms on your mobile device. Note that disabling cookies and/or other tracking tools prevents ORCHARD At The OFFICE from tracking your browser’s activities, however, some aspects of our site may not function properly if the ability to accept cookies is disabled. Compromise Protocol. In the event that any information under our control is compromised as a result of a breach of security, ORCHARD At The OFFICE will take reasonable steps to investigate the situation and, where appropriate, notify those individuals whose information may have been compromised. We will take other steps in accordance with any applicable laws and regulations. If you have placed an order with our system unintentionally, or do not receive your delivery, contact us immediately to receive a full refund. Our produce is guaranteed to be free from spoilage. If you are dissatisfied in any way with the quality of the produce, let us know right away and we will replace the fruit or issue a refund. Call 972.295.9091 for additional information. To cancel a single order, simply log in and remove the order by 4pm the previous day. If your account has been charged, it will be credited. If you'd prefer to be reimbursed, simply contact us via our form or call 972.295.9091. To cancel all future deliveries, you can log in and remove all line items from your "Recurring Orders" section or simply call us at 972.295.9091. As there are no contracts, there are no obligations. FRESH FRUIT FOR YOUR OFFICE!